The RP Photonics Buyer's Guide contains 23 suppliers for erbium-doped fiber amplifiers. The software RP Fiber Power can be used for analyzing and optimizing fiber amplifiers – for example, see a demo case for an erbium-doped amplifier. Figure 1: Schematic setup of a simple erbium-doped fiber amplifier. Two laser diodes (LDs) provide the pump power for the erbium-doped fiber. The pump light is injected via dichroic fiber couplers. Pig-tailed optical isolators reduce the sensitivity of the device to back-reflections. The setup shown also contains two “pig-tailed” (fiber-coupled) optical isolators. The isolator at the input prevents light originating from amplified spontaneous emission from disturbing any previous stages, whereas that at the output suppresses lasing (or possibly even destruction) if output light is reflected back to the amplifier. Without isolators, fiber amplifiers can be sensitive to back-reflections. Apart from optical isolators, various other components can be contained in a commercial fiber amplifier. For example, there can be fiber couplers and photodetectors for monitoring optical power levels, pump laser diodes with control electronics and gain-flattening filters. For particularly compact packages, various passive optical components can be combined into a photonic integrated circuit (planar lightwave circuit). Very high signal gains, as used, e.g., for the amplification of ultrashort pulses to high energies, are usually realized with amplifier chains, consisting of several amplifier stages with additional optical elements (e.g. isolators, filters, or modulators) in between. The shape of the erbium gain spectrum depends on the absorption and emission cross sections, which depend on the host glass. Also, the spectral shape of the gain and not only its magnitude is substantially influenced by the average degree of excitation of the erbium ions, because these have a quasi-three-level transition. Figure 2 shows data for a common type of glass, which is some variant of silica with additional dopants e.g. to avoid clustering of erbium ions. Other glass compositions can lead to substantially different gain spectra. Figure 2: Gain and absorption (negative gain) of erbium (Er3+) ions in a phosphate glass for excitation levels from 0 to 100% in steps of 20%. Strong three-level behavior (with transparency reached only for > 50% excitation) occurs at 1535 nm. In that spectral region, the unpumped fiber exhibits substantial losses, but the high emission cross section allows for a high gain for strong excitation. At longer wavelengths (e.g. 1580 nm), a lower excitation level is required for obtaining gain, but the maximum gain is smaller. The maximum gain typically occurs in the wavelength region around 1530–1560 nm, with the 1530-nm peak being most pronounced for high excitation levels, whereas low excitation levels lead to gain maxima at longer wavelengths. The local excitation level depends on the emission and absorption cross sections and on the pump and signal intensity (apart from that of ASE light). The average excitation level over the whole fiber length, as is relevant for the net gain spectrum, depends on the pump and signal powers, but also on the fiber length and the erbium concentration. Such parameters (together with the choice of glass composition) are used to optimize EDFAs for a particular wavelength region, such as the telecom C or L band. A good flatness of the gain in a wide wavelength region (→ gain equalization), as required e.g. for wavelength division multiplexing (see below), can be obtained by using optimized glass hosts (e.g. telluride or fluoride fibers, or some combination of amplifier sections with different glasses) or by combination with appropriate optical filters, such as long-period fiber Bragg gratings. The power of a data transmitter may be boosted with a high-power EDFA before entering a long fiber span, or a device with large losses, such as a fiber-optic splitter. Such splitters are widely used e.g. in cable-TV systems, where a single transmitter is used to deliver signals into many fibers. A fiber amplifier may also be used in front of a data receiver, if the arriving signal is weak. Despite the introduction of amplifier noise, this can improve the signal-to-noise ratio and thus the possible data transmission rate, since the amplifier noise may be weaker than the input noise of the receiver. It is more common, however, to use avalanche photodiodes, which have some built-in signal amplification. In-line EDFAs are used between long spans of passive transmission fiber. Using multiple amplifiers in a long fiber-optic link has the advantage that large transmission losses can be compensated without (a) letting the optical power drop to too low levels, which would spoil the signal-to-noise ratio, and (b) without transmitting excessive optical powers at other locations, which would cause detrimental nonlinear effects due to the unavoidable fiber nonlinearities. Many of these in-line EDFAs are operated even under difficult conditions, e.g. on the ocean floor, where maintenance would be hardly possible. Although data transmitters are normally not based on erbium-doped devices, EDFAs are often part of equipment for testing transmission hardware. They are also used in the context of optical signal processing. These functions can be realized in the telecom C and L bands. Other types of fiber amplifiers, e.g. based on praseodymium, have been considered for other bands, but none can compete with erbium-based devices in terms of gain and gain efficiency. A particular attraction of EDFAs is their large gain bandwidth, which is typically tens of nanometers and thus actually more than enough to amplify data channels with the highest data rates without introducing any effects of gain narrowing. A single EDFA may be used for simultaneously amplifying many data channels at different wavelengths within the gain region; this technique is called wavelength division multiplexing. Before such fiber amplifiers were available, there was no practical method for amplifying all channels e.g. between long fiber spans of a fiber-optic link: one had to separate all data channels, detect and amplify them electronically, optically resubmit and again combine them. The introduction of fiber amplifiers thus brought an enormous reduction in the complexity, along with a corresponding increase in reliability. Very long lifetimes are possible by using redundant down-rated pump diodes. Some EDFAs are specially designed for space division multiplexing. Most erbium-doped fiber amplifiers are based on single-mode fiber. However, other types of fiber amplifiers have recently been developed, which can be used in the context of space division multiplexing. Here, the fiber is either a multi-core fiber or a few-mode fiber. Such amplifiers need to be optimized such that the gain in the different cores, or in the second case for the different fiber modes, is quite similar. The only competitors to erbium-doped fiber amplifiers in the 1.5-μm region are Raman amplifiers, which profit from the development of higher power pump lasers. Raman amplification can also be done in the transmission fiber. Nevertheless, EDFAs remain very dominant. The most common pump wavelength for EDFAs is around 980 nm. Light at this wavelength pumps erbium ions from their ground-state manifold 4I15/2 to the 4I11/2 manifold, from where there is a quick non-radiative transfer to the upper laser level 4I13/2. Due to that quick transfer, there is essentially no deexcitation via stimulated emission by pump light, and very high excitation levels can be achieved. Therefore, this approach makes it possible to achieve the highest gain efficiency (order of 10 dB/mW) and the lowest noise figure, although the power efficiency is not ideal due to the significant quantum defect. A higher power efficiency can be achieved by in-band pumping around 1450 nm. However, stimulated emission by pump light then limits the achievable excitation level, hence also the gain per unit length, and the maximum gain occurs at longer wavelengths. The noise figure will also be higher. Due to the not very high laser cross sections, the saturation power of an EDFA is fairly high compared with that of a semiconductor optical amplifier. Therefore, single symbols in high bit rate data transmissions have a much too low energy to cause any significant gain saturation. Only over thousands or millions of symbols, the gain adjusts itself to the average signal power level. In high-gain amplifiers, amplified spontaneous emission (ASE) is often a factor limiting the achievable gain. Due to the quasi-three-level nature of the erbium ions, ASE powers can be different between forward and backward direction, and the maximum ASE can occur at a wavelength which differs from that of maximum gain. The noise figure of an EDFA is slightly larger than the theoretical limit of 3 dB for a high-gain amplifier; this is mainly due to the quasi-three-level nature. Relatively low-noise performance can be achieved with suitable amplifier design, taking into account particularly the erbium excitation level near the signal input end, which can be strongly influenced by, e.g., the pump direction. 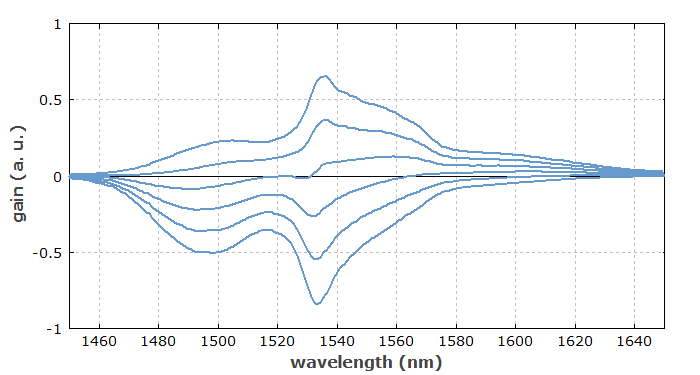 Various aspects of erbium-doped amplifiers can be analyzed with suitable fiber simulation software. The resulting quantitative understanding can be the basis for optimization of devices in terms of performance and required components. A high gain in a shorter length can be achieved with ytterbium-sensitized fibers (also called Er:Yb:glass fibers or ytterbium-codoped fibers). In addition to the erbium dopant, these contain some significant concentration of Yb3+ ions (typically much more ytterbium than erbium). Ytterbium ions may then be excited e.g. with 980-nm pump light (or even at longer wavelengths such as 1064 nm) and transfer their energy to erbium ions. For a proper choice of the material composition of the fiber core, this energy transfer can be fairly efficient. However, the use of pure erbium-doped fibers is more common in the telecom area, because ytterbium sensitization has no essential advantages here and possibly leads to a reduced gain bandwidth due to the modified chemical composition. Erbium-doped double-clad fibers can be used for generating very high output powers of tens of watts or even more. As the pump absorption efficiency can be weak in this case, an ytterbium-sensitized core may again be useful. It is also possible to amplify ultrashort pulses in the 1.5-μm region to relatively high energies, using EDFAs in the form of amplifier chains. One exploits the relatively high saturation energy of such amplifiers, particularly when using erbium-doped large mode area fibers.